Deerfield Beach is located on the eastern coast of Florida, 15 miles north of Fort Lauderdale. The city, with a population of approximately 78,000 (following a state-mandated land annexation increasing the population by 75 percent and land by 60 percent), is essentially built out with only 3 percent land vacant. With the population forecast to increase, the city is looking for ways to guide that growth into redevelopment opportunities that encourage walkability and connectivity, and promote its unique village character. Deerfield Beach lacks a cohesive identity, however, as well as a shared community vision. As part of a new vision, the city hopes to reinvigorate the "heart" of old Deerfield Beach around the intersection of Dixie Highway and Hillsboro Blvd. As an added dimension, the newly envisioned Deerfield Beach Village Center is also the proposed location for a new train station along the Florida East Coast Railway. 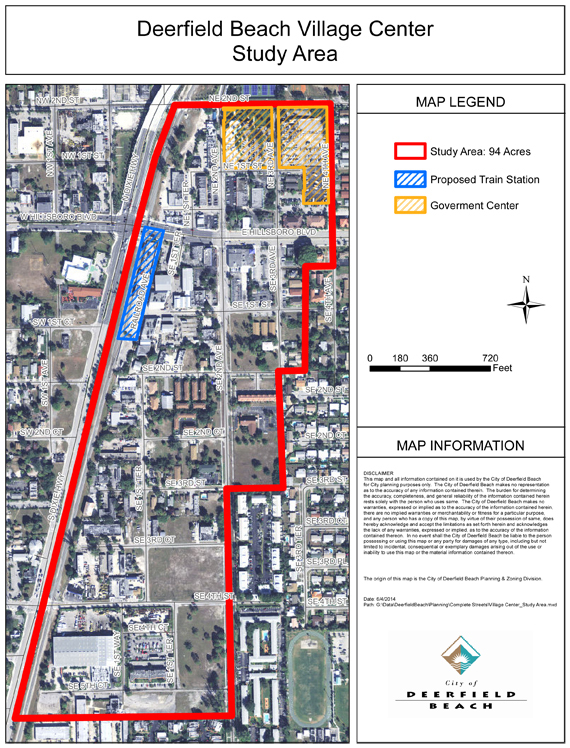 The planned Tri-Rail Coastal Link intends to reintroduce passenger rail service and connect historic downtowns of South Florida from Miami to West Palm Beach, including Deerfield Beach. A CPAT assisted the city in March 2014 with a strategy to create a walkable, mixed use district through the creation of a new land use category. The CPAT offered skills and expertise in land use, economic development and market analysis, landscape architecture, and urban design. Deerfield was primarily an agricultural community prior to the 1950s. Post WWII, the South Florida coast became an increasingly popular destination, including scenic Deerfield Beach. The tourism industry increased oceanfront development along the Atlantic coast and shifted focus away from the original town center of Deerfield. The full team arrived in Deerfield Beach March 16th and worked through the 20. Following meetings with city planning staff on Tuesday, March 17, the team conducted a tour of the study area. That afternoon, a group of almost 30 stakeholders met with the team. Team leader "Pete" Pointner, FAICP conducted a SWOT (strengths, weaknesses, opportunities, threats) analysis and engaged the local group in conversation about their vision for a revitalized town center. The team worked closely with city planning staff throughout the week to develop land use and urban design plans for areas north and south of Hillsboro Boulevard near Dixie Highway. Team leader Pete Pointner, FAICP and APA project manager Ryan Scherzinger traveled to Deerfield Beach on November 13, 2014 for a preliminary site visit. 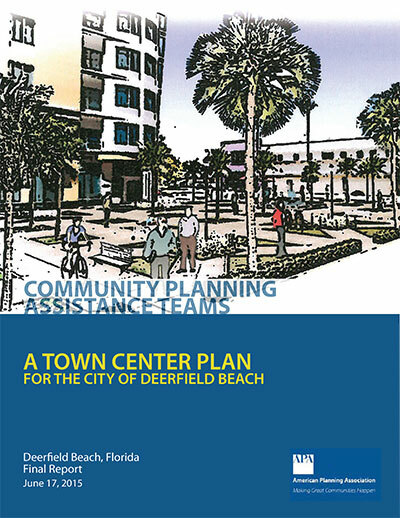 The two met with Deerfield Beach's Director of Planning and Development Services Amanda Martinez, AICP and members of her staff to discuss the project and tour the study area. Pointner and Scherzinger also met with City Manager Burgess Hanson and toured several other coastal communities in the region for further context and comparative examples. The Sun Sentinel: "Vacant site part of development plans"
Pete Pointner has focused his more than 50-year career on environmentally based planning and context sensitive design assignments. He has taught at the university level and has extensive experience as a consultant, municipal planner, and coordinating consultant for major public works projects and private developments. He has carried out assignments for more than 100 public sector clients and directed projects in 25 states and four foreign countries. His experience includes serving as as acting director of planning for five communities. He is the author of Planning Connections, Human, Natural and Man Made. Visit his website www.petepointner.com. Robert Gibbs is an urban planning consultant who has contributed to over 400 master plans across the U.S. He also planned Michigan's first 10 New Urban communities and Form Based Codes. He founded GPG in 1988, and has prior experience with JJR/Smith and Taubman Centers. In 2012, Gibbs was honored by the Clinton Presidential Library for his life's contributions to urban planning and development and by the City of Auckland, New Zealand, for his planning innovations. During the past 20 years, Gibbs has taught a continuing education course on urban retail planning and development at Harvard's Graduate School of Design. Margaret K. Rifkin is an urban designer and planner for the Maryland-National Capital Park and Planning Commission in Montgomery County, Maryland. Her work has focused on plans for transforming suburban areas into walkable, mixed-use centers and on urban infill development. She recently led an innovative outreach process for the Bethesda Downtown Plan. Rifkin is a member of APA's Urban Design and Preservation Division executive committee and leads its webinar program. She is an active member of the Congress for the New Urbanism and is a Registered Landscape Architect in the State of Maryland. Rifkin holds master's degrees in landscape architecture and city and regional planning. Over the past 16 years, Adam Rosa has demonstrated the ability to create implementable planning and design concepts focused on placemaking and improving existing neighborhoods. He believes that successful communities must blend transportation infrastructure and public space with appropriate land use and urban form. In his work with cities from Buffalo to Honolulu (and places in between), Rosa continuously strives to generate creative ideas and solutions that capture the culture, spirit and potential of the local community. He is a senior associate with Camiros, Ltd. and was recently chosen as one of the Next City Vanguard 40-under-40 "high-level, creative and ambitious people who seek to improve their cities."